In the world of video game entertainment, the competitive karaoke scene has long been dominated by Sony Computer Entertainment and the SingStar franchise. Great progress has been made to the series over the years, including the introduction of downloadable content via the SingStore. When you buy a SingStar game you can guarantee slick presentation, a scoring system that encourages competitiveness and a speech recognition system that demonstrates great rhythm and pitch detection. SingStar Guitar offers all of that, but for the first time thrusts a guitar into your mid-riff so you can now jam along too, as well as annoy the neighbours with your out of tune howling. Guitar Hero and Rock Band already have the guitar-shredding corner of the rhythm-based game market covered, so Sony has its work cut-out trying to provide an experience that matches these established franchises. Rock Band, for instance, has over 2,000 tracks behind it, while Singstar Guitar has just 30 songs on the disc with a further nine available to download from the SingStore and the promise of more content over the coming months. Nevertheless, there’s some decent tracks on the disc, including personal favourites "Disco 2000” by Pulp and "I Predict a Riot" by Kaiser Chiefs (full track list on page 3.) 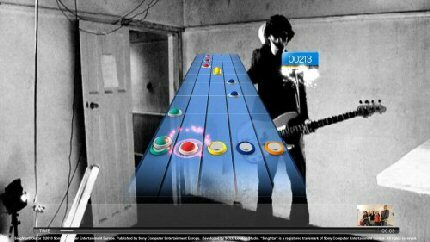 The main difference between Guitar Hero and Rock Band is that you actually see the official music videos playing the background, rather than cartoon characters rocking out on fictitious stages. It's actually a breath of fresh air to be able to play along with the videos.